Divisive issues immediately confronted Adam Silver; out of them he forged a long-lost unity and proved capable of overcoming obstacles in his first year as NBA commissioner. For that reason, Silver was honored with Sports Illustrated's 2014 Executive of the Year award. Last April 18 in New York City, Adam Silver held his first Board of Governors meeting as NBA commissioner. "You could tell right away that it was going to be different than any meeting we had before," recalls an owner. "More open, more inclusive, more collaborative. Any idea that came up, he said, 'I want to take a fresh look at it. I want to take a fresh look at everything.'" Silver broached a variety of previously untouchable topics—from the draft lottery to the playoff format to the league's minimum age for eligibility—and while no immediate changes were implemented, mere consideration showed the owners something about their newly minted leader. Despite two decades working under his predecessor, David Stern, Silver was his own man. Eleven days later he banned Donald Sterling for life because of racist comments the Clippers' owner made on a leaked audiotape, a punishment that was extreme but appropriate. A league so often divided between players and executives stood united behind Silver. His handling of the ensuing press conference will be studied for years in crisis management seminars—the succinct language, the forceful delivery, the controlled outrage—but that was the easy part. Silver acknowledged, during an interview in early May, he did not know how long the legal process to unseat Sterling would take. But by mid-August, Sterling was out and former Microsoft CEO Steve Ballmer was in, having paid a record $2 billion to buy the team. 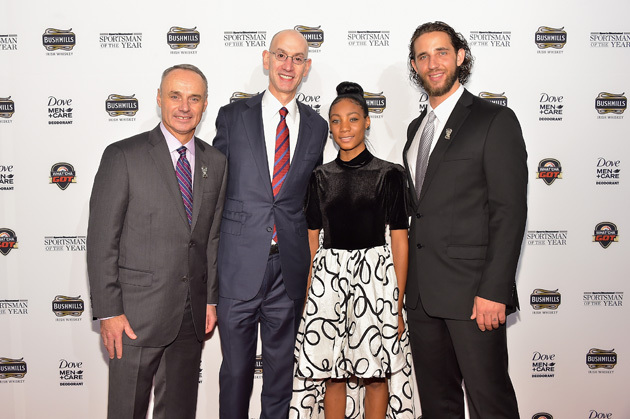 Rob Manfred, Adam Silver, Mo'ne Davis and Madison Bumgarner attend the Sportsman of the Year 2014 ceremony. Year One of the Silver regime will always be remembered for his handling of the Sterling crisis, but that was hardly the new commissioner's only move. He extended the All-Star break so weary players can grab more rest, opened a centralized replay center in Secaucus, N.J., and negotiated a nine-year, $24 billion television contract that stands to raise the salary cap. The league is sizzling with LeBron James back in Cleveland, Anthony Davis emerging in New Orleans and no fewer than six championship contenders in the Western Conference. The NBA, more than the NFL and Major League Baseball, produces megastars. This year Silver became one of them. He was bold (penning a New York Times op-ed that supported the legalization of regulated sports betting) and benevolent (using an honorary draft pick on Baylor prospect Isaiah Austin, who was diagnosed with Marfan syndrome, a career-ending genetic disorder that can cause the enlargement of the heart). Silver earned the title every commish would want in 2014: the anti-Roger Goodell. While the NFL commissioner was pilloried for suspending Ray Rice only two games and failing to articulate his rationale (and then saw his subsequent indefinite ban of Rice invalidated by an arbitrator last month), Silver suspended Hornets forward Jeff Taylor nearly a third of the season for domestic violence and released a thoughtful 989-word explanation. Taylor didn't even appeal the decision. All honeymoons end. In light of the new TV deal the players' union has already warned of another potential work stoppage in 2017, when both sides can opt out of the current collective bargaining agreement. Silver must work to divide the NBA's new riches in a way that appeases both factions. Obstacles will arise, but throughout a grueling first year, Silver proved capable of clearing them.